There are many places in north California with more impressive redwood trees, but Muir Woods is very popular (receiving nearly one million visitors each year) on account of its proximity to San Francisco, just 15 miles south via the Golden Gate Bridge. Named after the famous Scottish naturalist, conservationist and explorer John Muir, who visited here several times from 1903 onwards, the woods form a small part of the forested slopes of Mt Tamalpais, near the southern end of the Marin Peninsula. The east edge of this region is quite developed, along busy US 101 (the Redwood Highway) through such towns as Sausalito, Corte Madera and San Rafael, but most is still in a natural state, protected besides Muir Woods in several other parks, all part of the Golden Gate National Recreation Area. 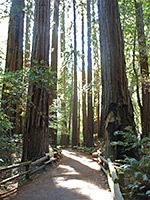 The central feature of the small, 560 acre national monument is a paved, level loop trail along a small stream (Redwood Creek), that passes several groups of large redwood trees and has a number of information boards about life in the forest. Most of the visitors stay here only the half hour or so necessary to walk the loop, rather than take the longer paths that climb the surrounding hillsides giving a much more peaceful and intimate encounter with the trees, although above the creek the forest mostly contains other species; in general, much of the original old growth coastal redwood forest of the Marin Peninsula was felled for timber in the nineteenth century. It was a local landowner and US Congressman, William Kent, who purchased one of the last surviving groves in 1905, donating it to the government who designated the area as a national monument in 1908. Today, some of the trees are still large, and the place is certainly atmospheric, though the crowds detract somewhat from the experience. South of San Francisco, the more extensive woods of the Big Basin Redwoods and nearby locations provide a better appreciation, while even more spectacular are the tall forests of the far north, principally at Redwood National Park. The closest towns with hotels near Muir Woods are Mill Valley (5 miles), Corte Madera (6.5 miles), Larkspur (7.5 miles), San Francisco (16 miles) and Novato (20 miles) - follow the links for hotel descriptions and photographs. 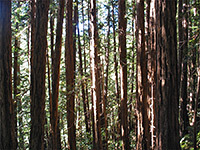 Muir Woods is usually approached from the east starting at US 101, a few miles north of Sausalito, by driving along the famous coastal highway Route 1 which branches off westwards through Tamalpais Valley. Signposts indicate the way to the monument, turning right at one junction then left at another, along a very bendy road - a test for the many tour buses that come here - that descends into a steep sided valley to a small parking area by the visitor center. A second parking lot is available 100 yards up the road but in recent years both would typically be full by mid morning, leading to the introduction, at the start of 2018, of a parking reservation system, the fee $8 per vehicle, which is in addition to the general entrance charge of $15 per adult (2019). There are no other nearby roadside parking places. Another option is to use the Muir Woods Shuttle, leaving vehicles at one of three pick-up points, in downtown Sausalito, Pohono Street, and Marin City. The main path is paved, and leads up the valley beside Redwood Creek to one of the two largest groups of redwoods (the Cathedral Grove), with an optional return on the other side of the stream past the second cluster, at the Bohemian Grove. Four bridges cross the stream, linking the two halves of the path every few hundred yards. The trees are tall but many are relatively thin, and the few remaining really old specimens are greatly outnumbered by younger redwoods. Before it fell in March 2003, the largest tree in the woods (a Douglas fir) was the 240 foot Kent Tree, which now straddles a streambed as it begins the centuries-long process of decay. The Redwood Creek loop can be completed in a leisurely half hour, while the more interesting side paths take between 1 and 3 hours to explore. The best longer hike in Muir Woods National Monument is the 3 mile loop up the Ocean View Trail, down the Lost Trail and back along the Fern Creek Trail. Brief descriptions of all trails are given below. 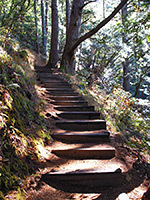 Ben Johnston Trail - The one path into the western half of Muir Woods is the 1.5 mile Ben Johnston Trail, which climbs steeply away from the redwood groves, 800 feet up to an open and often wind-swept ridge that has great views of the surrounding hills and the Pacific Ocean. The return can be along the Dipsea or Bootjack trails. Bootjack Trail - Past the end of the paved route along Redwood Creek, the path becomes the Bootjack Trail, soon exiting the national monument, entering Mt Tamalpais State Park and climbing gradually until the forest fades away, replaced by meadowland. Various other paths branch off including one (the TCC Trail) that in turn links with the Ben Johnston Trail to make a 6 mile loop. Dipsea Trail - the full length of this cross country path is 7 miles, running over the hills between Stinson Beach and Mill Valley. A short section passes through the south corner of the national monument, crossing the access road near the overflow parking area, and a short walk gives a good introduction to the forest. There are several options for loop hikes. 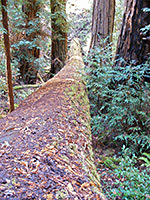 Fern Creek Trail - Beyond the end of the main paved loop, the Fern Creek Trail leads further up the valley beside a tributary of Redwood Creek, passing the fallen Kent Tree then joining the lower end of the Lost Trail. The route is only half a mile long and an easy walk. The creek does have ferns growing alongside though the scenery is not much different to the land nearer the visitor center, just with fewer people. Lost Trail - This path starts along the Panoramic Highway a short distance north of the national monument, descends a little to a junction with the upper end of the Ocean View Trail then drops very steeply through pleasant, airy forest via many wooden steps, down to the upper end of the main valley, where it meets the Fern Creek Trail. All is just outside the monument boundary. Ocean View Trail - Although no longer having a view of the Pacific Ocean (due to recent tree growth), the upper part of this path affords partial vistas over the surrounding hills. The trail climbs quite steeply up the east side of the Redwood Creek valley, winding around half a dozen side ravines, through thick, dark, cool woodland containing a mixture of Douglas fir, madrone, bigleaf maple and tan oak, with redwoods only at the lower end. It gains 600 feet in just over a mile, meeting the Lost Trail just outside the park boundary.